Prochem Calipots are used to confirm correct dosing rates from system dosing pumps. The Calipot is normally filled to a set level. The dosing pumps are then fed from it for a pre-set period – usually one minute or more. Next, the pumping rate is then checked against the time-calculated flow rate. Calipots are normally a permanent part of the installation and can be supplied with three way valves so that they can be used in and out of circuit to suit operational needs. All standard Calipots are designed for atmospheric pressure operation but pressurised units can be supplied to order. PVC units utilise a transparent PVC tube and solid PVC base and top. 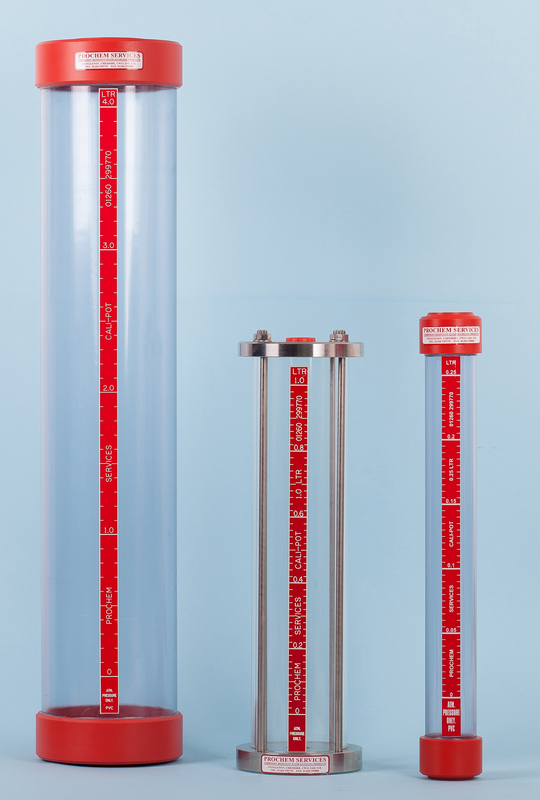 Metal units use a rugged precision borosilicate glass measuring cylinder clamped between the base and top. In all cases the scale is mounted directly on the measuring cylinder. Two types are available – base mounted and backboard mounted. For glass tubed units protective PVC or metal shrouds are available as an option for rough or toxic duty applications.